When speaking of electrical cars we often tend to think about where to charge them. Now why not go for what’s available – and transform? Ever been to Japan? One thing you will most likely find when revising your pictures are vending machines! There are literally one on each corner of the block. Here’s more! 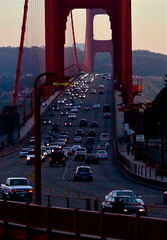 Recently, during my research & photography tour in the US, I got a good look of this great bridge. Next trip, I’ll be there with a convertible! Now the Golden Gate is Iconic to the city of San Francisco. That got my strategy neurons started – what’s my iconic impression on customers – and prospects? You know what yours are? And here’s a video of the Bridge!